In 2005, for a project in collaboration with artist Patrik Entian, we set up a computer to automatically download images from a web camera installed by scientists at Centro National de Prevacion de Desastres, as part of their surveillance of the volcano Popocatepetl. [x] This is one of the most active volcanoes in the world, situated 70 kilometres from Mexico City, and of a highly explosive nature. A week-full of pictures were downloaded by the computer every now and then for a couple of years. 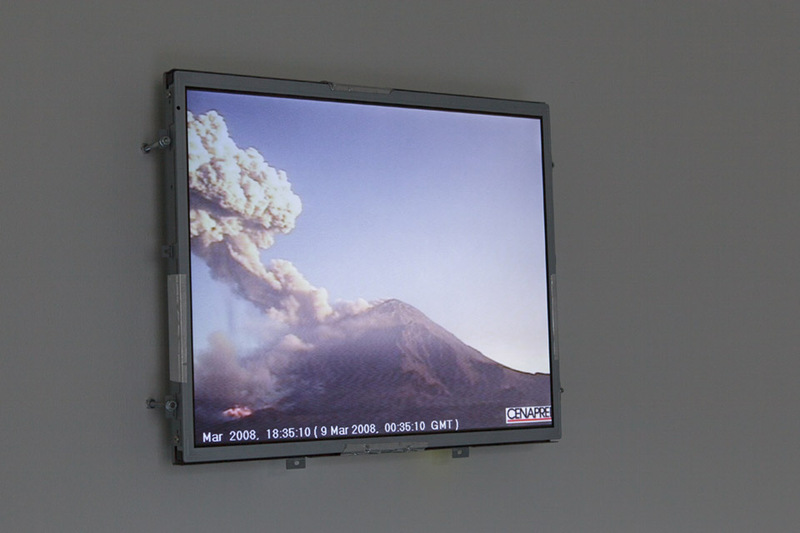 The web camera is mounted on a fixed point in the landscape and maintains a static view on the volcano. As a result, the volcano manifests itself as a stable structure with unstable qualities, fuming, glowing and sometimes bursting with ash. These processes, as well as those of cloud formation, seem chaotic, while the changes in light and seasons are cyclical. Wanting to combine the images in a way that would reveal, through the combination itself, the constant tension between stability and change, linearity and cycles, I applied a careful editing procedure where the images were combined in cyclical patterns. It was a work that got me, for the first time, interested in working with video as a pre-edited composition, as opposed to treating video as process, based on its capacities as a signal. The result was a time-lapse movie, but one that broke with the convention of linearity in favour of repetition and cyclical processes. Having sorted and categorized the webcam images of Popocatepetl according to visual criteria rather than temporal ones, a procedure facilitated by the computer’s need to organize data in databases, I structured them in a cyclical pattern that created accelerating structures. The static volcano, occupying more than half of the image, was present in every single image, while everything else in the picture were subject to change, in repetitive cycles. By using small loops, and adjusting the in-points and out-points I introduced new images in each repetitive cycle of the loop, a strategy inspired by the work of minimalist composer Steve Reich. While a time-lapse movie normally represents a passage of time simply by being a linear sequence of images that follow each other in the same succession as they were shot, the loop offers a way of constructing time in a cycle that returns to the same disasters again and again. Through incremental tweaking and working with stillness versus acceleration, repetition versus change, signal versus noise, the volcano material was transformed into a visual site of passion and rage. The video was finalized for a commission where it accompanied the musical composition Elektra for electronic violin and live processing by the composerKnut Vaage, performed by Victoria Johnson. It has been shown as a projection in various contexts, sometimes alone and sometimes with a musician performing in a dialectic relationship with the video. See also the blogpost Askefast.